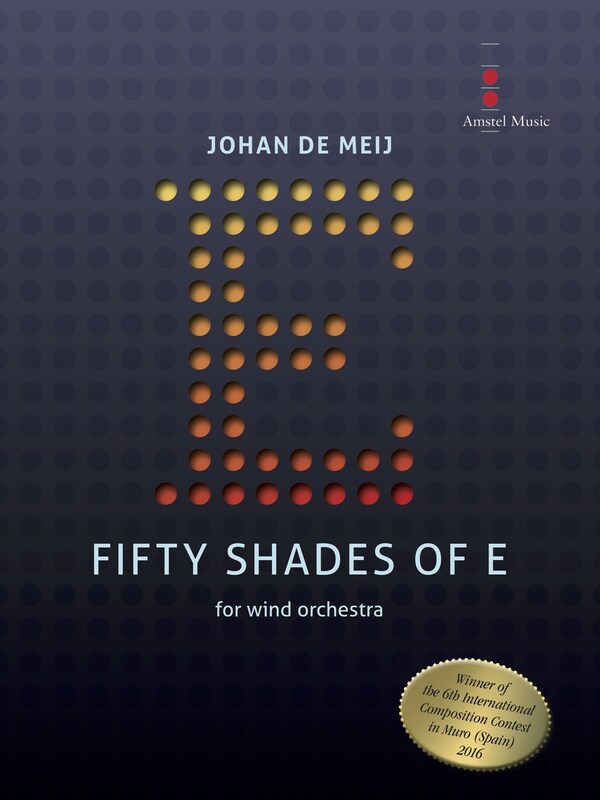 Fifty Shades of E is a musica lexpedition to discover the myriad nuances of the note E. Throughout the work, the E keeps one foot on centre stage while venturing out through various movements. From its basic tonal functions to when it shimmers under a lyrical guise, the E is seen, heard and experienced from every aural angle. After a short, mysterious introduction in the low brass and percussion, a straightforward unison chorale melody is played by the entire ensemble (measure 11). This thematic subject will only emerge fully at the end of the work (m. 355). The subsequent fugue on the chorale theme begins in the bass register (m. 25), and gradually soars via superimposed fifths within the whole orchestra. At the same time, the tonal idiom becomes more and more unruly. The various groups reunite in a massive rhythmic unison (m. 107), which lands in E major. The melodic percussion and piano continue by playfully engaging the E, using minimalistic, repeating patterns with skittish, consonant additions (m. 117). The chorale theme soon emerges in four different rhythmic and melodic passages in - successively - trombones, horns, saxophones and clarinets. With deliberation, the rhythmic pattern grinds slowly to a halt. In a free cadenza, six solo woodwinds break the mood by visiting and embellishing the main theme, one after another, from high to low. Before measure 207, the baritone sax lingers on its own: its cadenza forms the bridge to the capricious Allegro agitato (m. 207), interspersed with staccato motions and hammering strikes. After a quasi-Beethovian sequence (m. 307-354) leading to the main theme in a minor key (m. 355), a radiant conclusion follows – inevitably – into a sounding unison E over seven octaves. Fifty Shades of E is the winner of the 1stPrize in the 6th International Composition Contest “City of Muro 2017” (Muro, Alicante – Spain). The Jury, consisting of Carlo Pirola (Conservatory Giuseppe Verdi - Milan), Voro Garcia (Conservatory of Music - Valencia) and Francisco José Gallego Martinez (Conservatory Mestre Molins - Quart de Poblet) were unanimous in their decision.